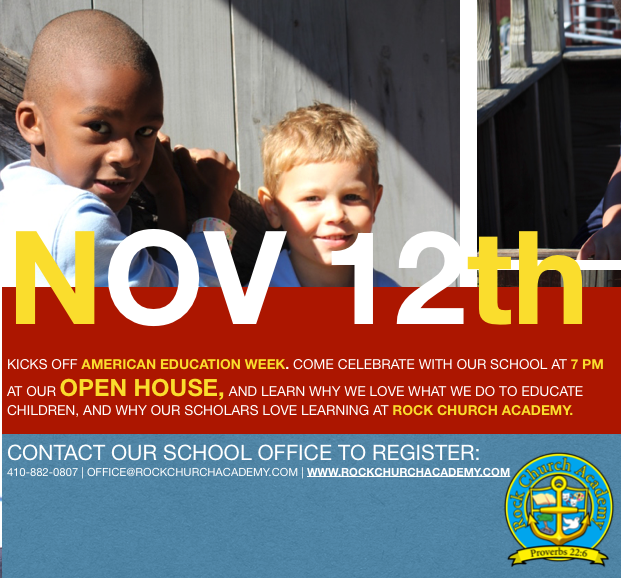 Come join Rock Church Academy as we kick off American Education Week at our Open House on Monday November 12th at 7pm. Find out why we are thankful to educate, and why our Scholars love learning at Rock Church Academy. We’re compacting a week’s worth of fun into one night to celebrate educators, parents as the first educator, our scholars, and scholars to be! Create fun make and takes, see what our scholars are learning and have engineered for this fun filled educational week, and learn all about RCA. Our hosts of great Instructors, Alumni and friends are all excited to meet you, and we hope to see you and your families there! Register to attend today by contacting our school office at 410-882-0807, or by email at office@rockchurchacademy.com.